World Baseball Classic set a new Replay Review record for most video reviews over a two-inning span in just its first game of having full replay at its disposal, while tying an expanded Replay Review record for most reviews in a single contest. Lance Barksdale and Eric Cooper in the 5th. 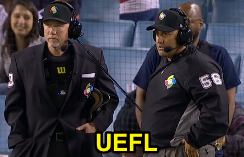 Due, in part, to the suspension of Manager's Challenge rules for the WBC tournament (all replays are initiated via Crew Chief Review in international play), Crew Chief Eric Cooper and his fellow umpires donned the headsets four times during Monday's Puerto Rico-Netherlands game at Dodger Stadium, with their first replay occurring in the top of the 4th inning and the final one taking place in the bottom of the 5th—setting a new professional baseball record for most replays over the fewest amount of innings played. Not so coincidentally, those two innings—top 4 through end 5—took over an hour (1:03:15 to be exact) to complete, corresponding a pace of play of 4:44:33 over nine innings. For the record, just one run was scored between the teams during the two-inning span. Rob Drake and Eric Cooper await word. Never before had Major League Baseball experienced four replays in just two innings of play, or one replay per half inning over that period. The replays contributed to a total game time of four hours, 19 minutes for 11 innings of work: that prorates to a 3:32 nine-inning game, which is significantly greater than the league-average mark of three hours, one minute (and the game's 11th inning would have taken longer had the 11th's two half-innings not started with runners placed at first and second base, pursuant to WBC tie-breaking rules). Replay Review 1, Top 4: Tag play at second base on Kalian Sams' infield single, initially ruled "safe" by 2B Umpire Rob Drake. After review, Drake's ruling was affirmed. Safe. Replay Review 2, Bot 4: Tag play at third base on Eddie Rosario's attempted steal, initially ruled "out" by 3B Umpire Eric Cooper. After review, Cooper's ruling was overturned. Safe. Replay Review 3, Top 5: Tag play & home-plate collision/blocking rule 6.01(i)(2) on Jonathan Schoop's attempted score, initially ruled "out" and no catcher's violation by HP Lance Barksdale. After review, Barksdale's ruling was affirmed. Out, and no violation of the HP collision rule. Replay Review 4, Bot 5: Slide interference rule 6.01(j) on Angel Pagan's slide at second base, initially ruled "out" and no runner's violation by 2B Umpire Rob Drake. After review, Drake's ruling was affirmed. Out, and no violation of the bona fide side rule. In 2015, the first instant replay cycle in MLB history occurred in Boston when umpires reviewed one play at every base. Of the four reviews, two were confirmed and two were overturned.